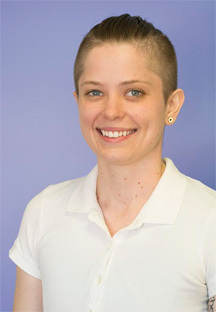 Ellie Emberley is a Registered Massage Therapist who graduated with honours from the Canadian Collage of Massage and Hydrotherapy in June 2014. In addition to massage therapy, Ellie has also studied Emergency Medicine at the Saskatchewan Institute of Applied Sciences and Technology where she graduated as a Primary Care Paramedic in 2007.
deep tissue, sports massage, pregnancy as well as infant massage and lymphatic drainage. During her education, Ellie had the opportunity to spearhead a research project focusing on fascia and how its restrictions can prevent healing in the body. From this project she gained experience regarding how to efficiently manage fascial restrictions that are causing pain and preventing normal movements. Through her academic placements Ellie has also had the chance to work with clients with various comorbidities, as well as clients managing a variety of mental illnesses. Over the past two years Ellie has had the opportunity to volunteer at a variety of city events such as the Goodlife Toronto Marathon and Run for the Cure. Working at these events has provided her with some great experiences and has led Ellie to focus on the importance postural balance and muscle health.